Your doctor may recommend treatment to shrink or remove the cyst if it doesn’t go away on its own or if it grows larger. 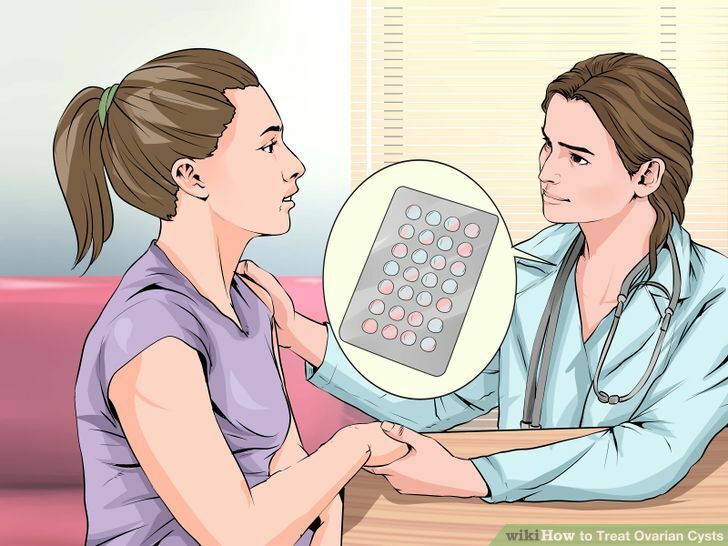 Birth control pills – If you have recurrent ovarian cysts, your doctor can prescribe oral contraceptives to stop ovulation and prevent the development of new cysts. Oral contraceptives can also reduce your risk of ovarian cancer. The risk of ovarian cancer is higher in postmenopausal women. Laparoscopy – If your cyst is small and results from an imaging test rule out cancer, your doctor can perform a laparoscopy to surgically remove the cyst. The procedure involves your doctor making a tiny incision near your navel and then inserting a small instrument into your abdomen to remove the cyst. Laparotomy – If you have a large cyst, your doctor can surgically remove the cyst through a large incision in your abdomen. They’ll conduct an immediate biopsy, and if they determine that the cyst is cancerous, they may perform a hysterectomy to remove your ovaries and uterus. Routine gynecologic examinations can detect ovarian cysts early. Benign ovarian cysts don’t become cancerous. Symptoms of ovarian cancer can mimic symptoms of an ovarian cyst. Thus, it’s important to visit your doctor and receive a correct diagnosis.